We have been looking recently at the question of what types of books sell best. We have no shortage of hypotheses. But every book and every sale are unique and there are many genres and many rooms. The age of the book, its condition, its price, its position on a shelf, the appeal of its cover, and whether the author is well-known all seem likely to be relevant somehow. The number of potential variables make it hard to do the analysis, let alone find any general guide. Now we think we might have found one useful rule, inspired by some excellent investigations done by our bookstore manager. Because it seems that how recently we processed a book into our stock is associated with how quickly we will sell it. Be prepared, this is quite a long story. You might like to get a cup of tea. Here is the track of the 503 books processed in to our stock in August 2017. This shows the proportion that we sold in that month and the following 12 months. You can see that in August itself we sold 9 per cent of them (45 books) and by August 2018 we had sold nearly half. We can see the same effect in a different way by looking at the age of the books we sold in a single month. The chart below shows the time of processing for the 642 books we sold in August 2018 that we can track. This greater saleability of more recently acquired books is not because there are more books from 2018 on the shelves. The next chart repeats the proportion of sales (in maroon) for August 2018 from the previous chart against the proportion of stock (in blue) from that time. 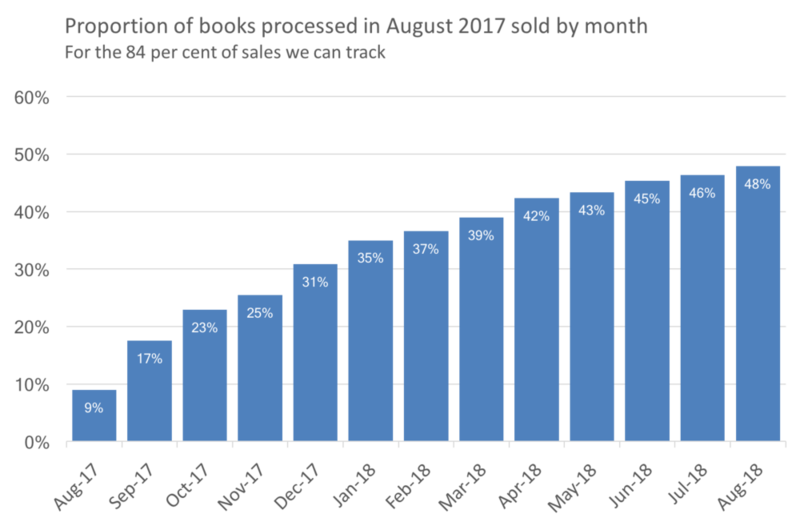 Books processed in August 2018 made up only six per cent of stock. The effect (more recent books accounting for a disproportionate share of sales) is consistent by year, with stock from 2016 accounting for 16 per cent of August 2018 sales but 63 per cent of stock. You can also deduce that we have processed a lot more books so far in 2018 than we did in 2017. The proportion of newly-processed books that are sold varies from month to month. Here are the tracks of the 10,082 books processed into our stock between August 2017 and March 2018, showing the proportion sold in the following months. I have made it a line chart for ease of reference, with each month a separate line. You can see that we have sold somewhere between 35 and 60 per cent of books six months after processing. The worst performing batch of books (the bottom line in the chart) so far have been the 503 from August 2017 (the first chart above). The best performing so far are the 768 from November 2017. The orange line on the chart is the result of averaging all of those tracks into one, ie, the proportion of books that we would expect to sell of any new batch we processed in the months after they appear on our shelves based on our history so far. Using this average, a newly processed book has a 27 per cent chance of being sold in the first two months. The chance of sale grows much more slowly each month after that. After six months we will have sold about half of the books. I don't know yet what is driving this effect. It could be that these books are just more saleable (more what people are looking for, in better condition, priced and displayed better). This would mean that what we are seeing is just be the result of sorting through all the books by our customers, taking the appealing ones and leaving the others. The chance of sale per month does not seem to reduce when we process more books. This means that we generate more revenue from newly processed books when we process more of them. The last chart shows the revenue earned after six months from the books processed between August 2017 and March 2018, ordered by the number of books processed in each month. The months when we processed the most are on the left. The yellow line shows how many books we processed in each month, against the right-hand scale. It seems likely that processing books increases sales overall. But I guess it is theoretically possible that customers buy the same number of books they would anyway, ie, they buy newly-arrived books if they are available but otherwise they make do with what they can find. Just eyeballing the numbers, I can not see an obvious correlation between the number of books processed and total sales in a month but there are a lot of influences, so it might be something to come back to with a more formal mathematical approach. We can also look at books processed by genre, look for situations where we processed a lot of books in a particular genre in a month, and see what happened to sales in future months. An alternative to either of these would be to do a test, ie to process a lot more or a lot fewer books for a month (enough to show up in total sales) and see what happens. If we process 1,000 books we would expect to see roughly 270 sales in the subsequent two months. If sales of newly-arrived books are entirely additional, then total books sold would go up by 270 over two months, which is around 20 per cent. Of course, we couldn't be completely sure they were additional sales, but at least it would give us a bit more information to work with.